Make your holiday table sparkle this year. I just love the way red and white blend with pine! 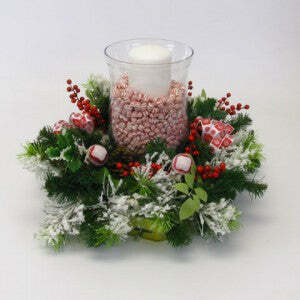 If you are hosting dozens of guests or it’s just a small dinner, candy and centerpieces blend together perfectly. You can start with a small wreath or sticking greenery into the foam. Once you have a full and fluffy green arrangement, start adding the pops of color and any other fun notions that you’ve found for your centerpiece. In the center, place the glass cylinder. To save some money on candy, put a glass tumbler or a tin can in the center upside down with the candle on top. This will keep a section of the cylinder empty, therefore using less candy. Fill around the candle will small candies. We used peppermint gems. Light the candle, gather your friends, and enjoy!